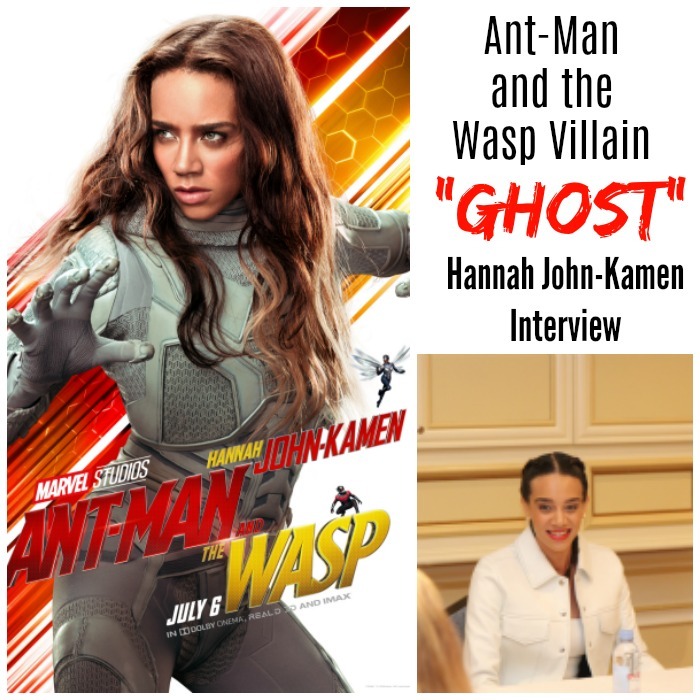 Hannah John-Kamen – Ghost! Villain or No? I remember seeing the image on my computer screen for the very first time. Ghost. Newest Marvel villain. I knew instantly that this villain would be feared by children everywhere, maybe even a few adults. With a ghostly off-white/pearly-gray “uniform” of sorts, face covering, and ability to go through walls, this villain had some serious potential. 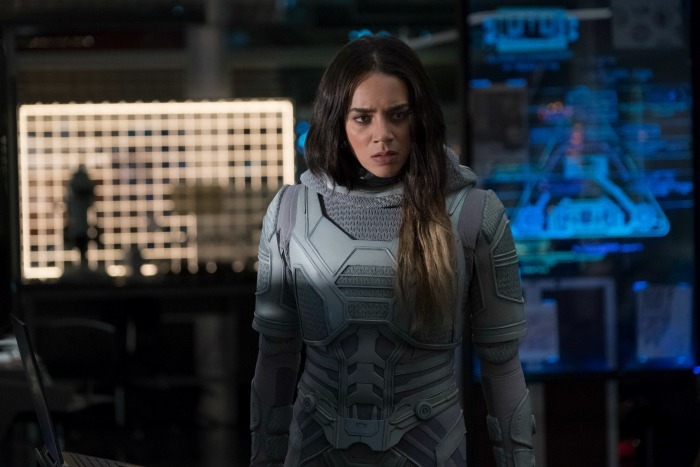 What I didn’t realize during that first trailer screening was that Hannah John-Kamen, Ghost, might not be the villain that I was expecting. And she was the perfect actress to attempt it in Ant-Man and The Wasp. Hannah John-Kamen Ghost! Villain or No? Turns out that Ghost is not really a new Marvel villain after all. This elusive foe came directly from the comic books, so Marvel loyalists might recognize the name. Surprisingly, in the comics the character didn’t have much of a backstory. Enter Marvel. Ghost’s ability to go through walls and be completely intangible is quite impressive and pretty startling at times. With a beautifully brilliant British accent, Hannah John Kamen swept into our interview wearing colors eerily reminiscent of a ghost. She admitted she was keeping the theme going as she sat down among us, relishing in this moment, and taking in the gravity of what she has joined. 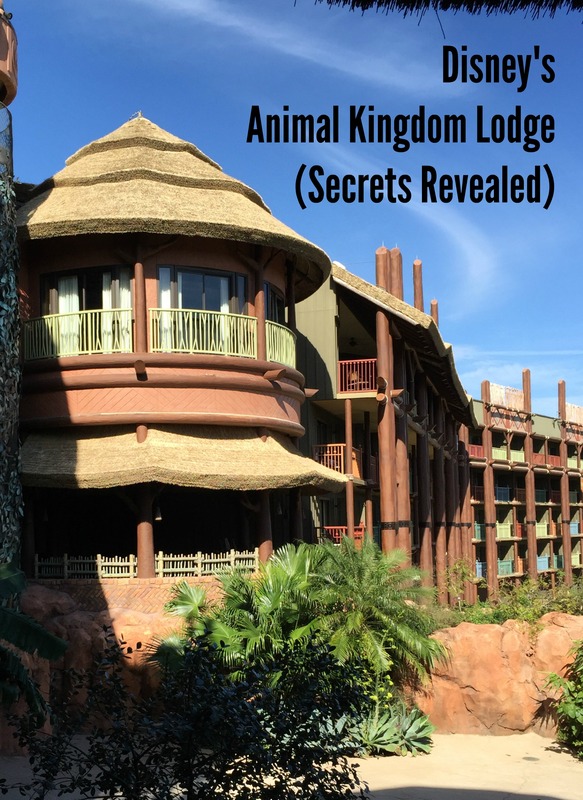 John-Kamen shared, “I was so excited to join the Marvel Universe, but it was also daunting. It’s overwhelming. It’s a huge responsibility to take this amazing character off the comic book page and be the first person to introduce it into an incredible movie with incredible cast members, which, you know, they’re heroes in life. They are legends. So, yeah, it was amazing. Very exciting. It wasn’t difficult for her to want to join the Ant-Man family as she was a huge fan of the first movie. The process involved an audition tape first, then heading to Atlanta for a camera test, where she met Director Peyton Reed in person. Ghost as a Marvel villain originated as a male character. Yes, Marvel is taking license here and taking a new spin on an old character with making Ghost female! Funny thing. Hannah John-Kamen didn’t know that the character was originally male until she googled it. I was curious about that backstory (though I won’t divulge that here for obvious reasons), and had the opportunity to talk with Hannah John-Kamen about helping shape her own character. Though the main themes were already fixed, she shared that “the script did change and adapt” because they were all figuring out the character together. Things changed along the way as she helped “massage the character in certain ways.” A talented actress indeed. Playing a villain has to be pretty interesting I would imagine. It’s almost as if you get to let everything go and be the worst possible you, right? This is something my husband and I have been wrestling with, especially since watching Avengers: Infinity War months ago. Thanos gave us pause. He is most definitely a villain, but you started to see the reasoning behind his choices. Anything is possible with Marvel. That much I know. Hannah John-Kamen does it all. Really. She’s got the imagination to take on the green screen (which impresses even Michael Douglas). But more than that, she literally does her own stunts. WHOA! 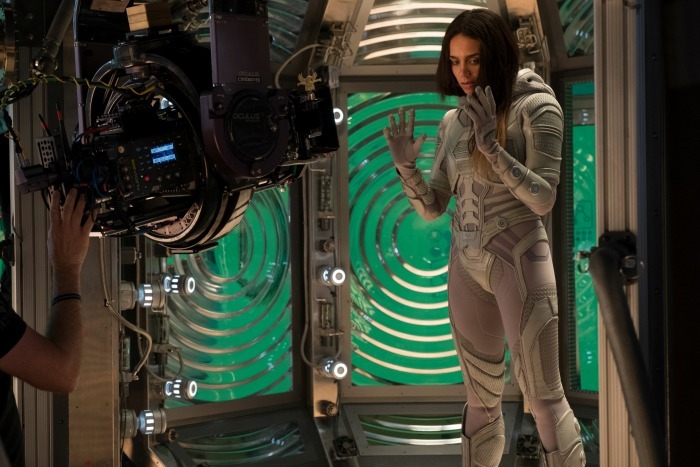 I started to think about all the action scenes with Ghost in Ant-Man and The Wasp, realizing it was HER in each movement. Let’s just say I wouldn’t want to get on the bad side of either Ghost OR Hannah John-Kamen! It’s clear that the women of Ant-Man and The Wasp have a lot to say on the subject, and Hannah John-Kamen is no exception. She wants young girls to have their action figures and play with them and know that they too can be just as strong! 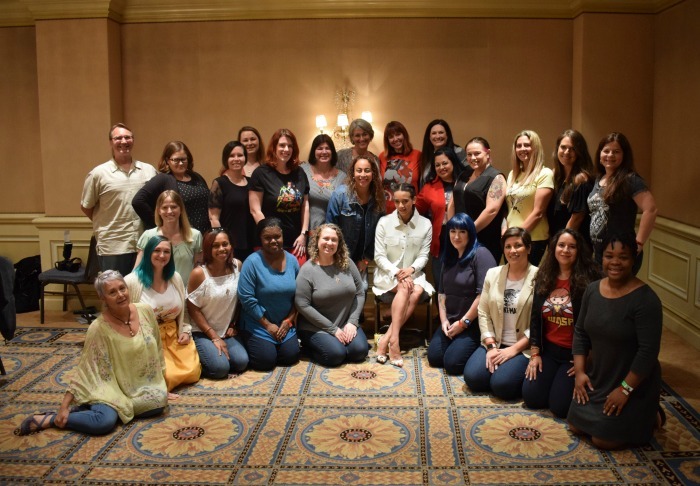 Having met both Hannah John-Kamen and Evangeline Lilly in person, it was easy to imagine them saying “Girl Power” and high five-ing each other. The question was asked. And her answer was perfection. 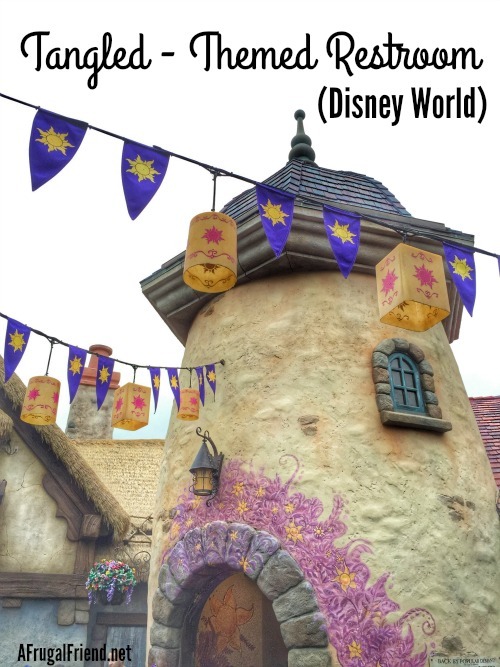 Q: If you could be a hero, not a villain, which character would you be? A: I’d be Ghost, ’cause she’s a hero. I wouldn’t change a damn thing. 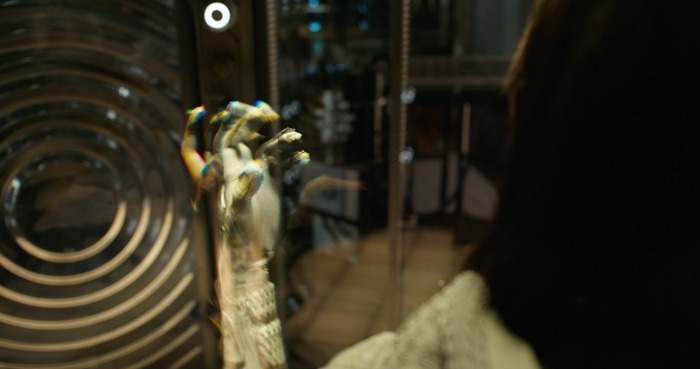 Now let’s take a look at the film, and Hannah John-Kamen Ghost! Stay tuned for my director interview with Peyton Reed! 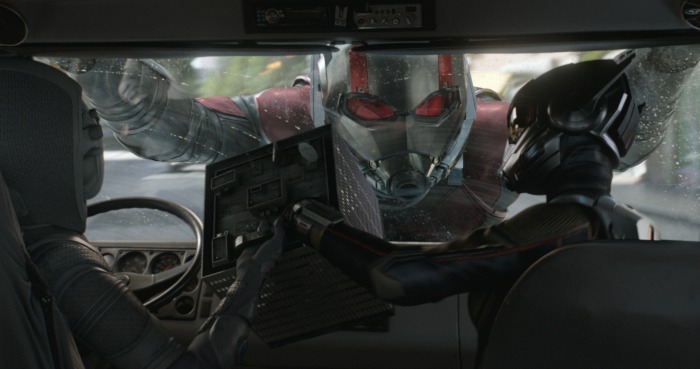 I’m telling you… the surprises with Ant-Man and the Wasp are never ending!! 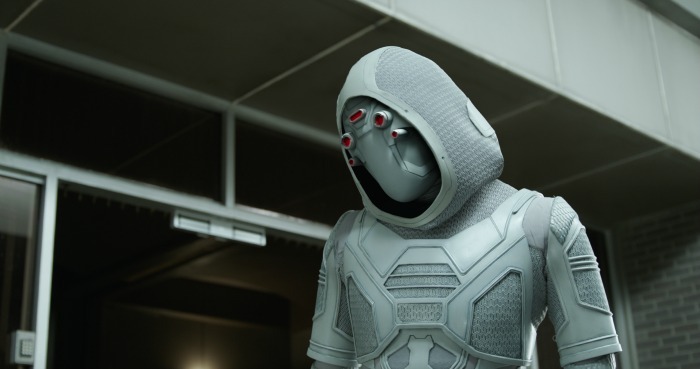 I loved Ant-Man and the Wasp but knowing that ‘Ghost’ did her own stunts has me wanting to re-watch it. Oh yes Sara, me too! Impressive!